Twenty-one-year-old #ride5000miles member Cameron Southey is bidding to be one of the youngest to circumnavigate the planet – and he’s doing it on a 2006 Suzuki GS500F! 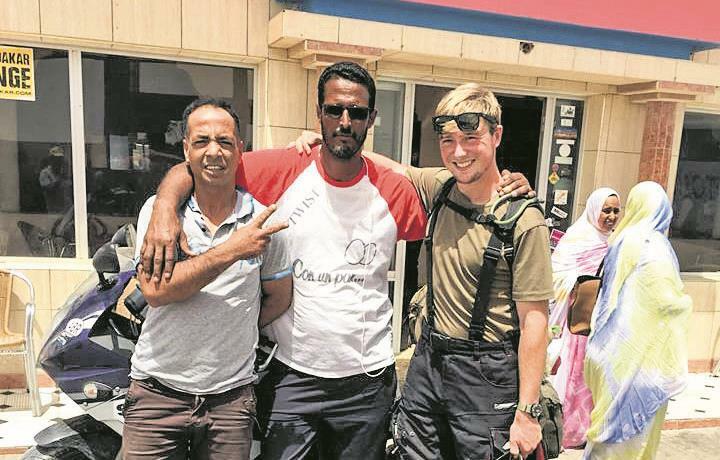 Starting in Europe in August, he’s just completed his 5000-mile marker while in Mali, with 15,000 miles still to go. He plans to ride through Africa, before heading to India, Malaysia, Australia and then North America. While most riders choose a big-capacity adventure bike for a trip like this, Cameron’s choice was dictated by expediency – he took the bike he owned. "I had already done an 11,500 mile solo Europe trip on it. I put some handguards and crash bars on it and made my own pannier rack out of steel. "The bike has been great, it easily gets 55mpg and it uses hardly any oil. The front brakes are sticking at the moment, but I’ll get them serviced in Bamako, the capital of Mali." During the last 5000 miles Cameron and his Suzuki GS500F have had to enjoy long hard days, extremes of heat and cold, crashes and lots of off-roading on a machine built for commuting rather than scaling a sand dune. "Off-road – it is great in mud, rocks and shallow sand, but I’ve gotten stuck loads of times in deeper sand, particularly in the Sahara," he says. "But then you just get off of the bike and push it and it’s usually fine. It weighs about 230kg fully loaded but it’s quite low so that’s no problem. Me and my dad fitted a Suzuki SV650 shock and Hyperpro fork springs which have helped loads. "It’s hard to say what’s the best part, but the thing that stands out most is the smile I get when I wave to people, I think it must be weird for them to see this strange man on a foreign bike waving at them! "There have been some tough times though – crossing into Senegal from Mauritania, where I was stuck at the border for a couple of hours haggling with everyone to let me through, before getting the bike stuck in sand twice and getting lost, in the dark and with no food. "That sucked, but I found the campsite. In Morocco, I gave sweets to some kids and turned about to find one rummaging in my backpack, which was a bit sad. But you learn to be cautious. "I had previously been following Kane Avellano, the current record holder, and that was how I realised the record was on the cards – all I had to do was go out and do it. I am 21, my 22 birthday is October 18 and I hope to be spending it with some of my family in South Africa." Cameron and his GS500F still have a long way to go, but his efforts so far prove that you can go travelling and clock big miles on any bike, you just need to be determined to succeed.